Every now and again, a winemaker comes along that helps to shakes things up in a wine region. Sometimes the change come about via a championed grape, as was the case with Bodega Catena Zapata and Malbec in my last post. Sometimes it’s their belief in the potential of a region, such as winemakers like Robert Mondavi in Napa. And sometimes the change comes forcing a rethink of farming and winemaking practices of the area, which was the case with Marcel Lapierre and the rest of the “Gang of Four” in Beaujolais. Marcel Lapierre took over his family’s domaine in 1973. He was a bit of a radical, but didn’t really know how to direct his energy. That is until 1980 when he met Jules Chauvet, a researcher, wine merchant, and chemist, who was also making small quantities of his own wines. Chauvet had never liked the chemical fertilizers and pesticides that began to take hold in the 1950’s,and he spoke and published widely against them. He’d been making his own wines without them for years, also using native wild yeast for his fermentations. At the time, Beaujolais was still riding high on the Beaujolais Nouveau boom. The stuff had become popular in the 1950’s because it was (is) cheap and cheerful. It also releases early, making it a cash cow for winemakers. A big hit all around! Yay for everyone! Cheers! . . . . but . . . there’s always a “but” . . .
To keep up with increasing demand, many winemakers had begun to resort to less than rigorous winemaking practices. Winemakers would push their vines to yield twice the recommended amount, quality be damned. (According to an article in the Guardian, this was colorfully referred to as “faire pisser la vigne”, or “making the vine piss.”) They’d use synthetic yeasts to give the fermentations a kick in the pants, chaptalize with added sugar to increase alcohol, and would then use big doses of sulfur to halt those fermentations and cover up flaws. In the middle of this lucrative, if not particularly quality conscious party, Chauvet’s ideals seemed pretty radical. Nonetheless, it caught Lapierre’s attention. He and a group of winemaker friends–Guy Breton, Jean-Paul Thévenet, and Jean Foillard–banded together to to put Chauvet’s message into action. They called for a return to old winemaking practices, called for a return to the old practices, advocated for the use of old vines, never used herbicides or pesticides, they harvested late for fully ripe grapes, used only the healthiest grapes, sorting out anything but the best, and kept sulfur usage to a minimum. Importer Kermit Lynch dubbed this group the “Gang of Four” and they essentially helped lay the groundwork for the modern natural wine movement today. None of this was easy. The group was seen as pretty eccentric. Sulfur, for example offers protection against bacteria and control over fermentations. (It can be a very useful tool, but it was being overused.) It took years to get consistently good wines using little or none at all. The group persisted though, and nowadays, these guys make some pretty kickass wines. When I see a Lapierre wine on wine list, I tend to immediately gravitate towards it because they’re food friendly and pretty reliably delicious! Sadly, Marcel Lapierre died unexpectedly in 2010. His son Mathieu and daughter Camille picked up where their father left off and continue onwards. Marcel was already following organic farming practices, without use of pesticides or herbicides. According to one source, he’d also started experimenting with biodynamic principles as early as 2003. His kids have continued that work, moving the ball forward by increasingly farming using biodynamic practices. 2. This story includes a lot of buzz words: Organic/Biodynamic/Natural Wine. The Lapierre wines bring together a lot of the concepts together and I thought it’d be perfect to use this wine to about all of those ideas. I started out to define them here, but as the post got longer and longer, I was forced to realize that it has to be its own post. Stay tuned. I opened up the Marcel Lapierre Morgon 2017 the other night and tasted it with my co-workers at Bay Grape. As a group we picked up notes of raspberries, lingonberries, white pepper, violets, hints of dried herbs, and a pinch of spice. The fruit was tart, but there was a smooth ribbony texture to the wine. There was a little funkiness when we first opened the bottle. As it got air, the funkiness subsided and settled into a pleasant earthiness. More stoniness came out as the wine opened up as well. It is grown on granitic soils (for which Beaujolais and particularly Morgon, is known) and I think that started to express itself with time. Morgon is known for being one of the fuller-bodied and more tannic of the Beaujolais Crus, but this one was much lighter than expected. (Previous vintages were fuller in my memory.) Tannins were light as well and it had refreshing acidity. There’s any number of dishes that this wine would pair well with, but it was cold and rainy on this particular evening and I wanted something warming. 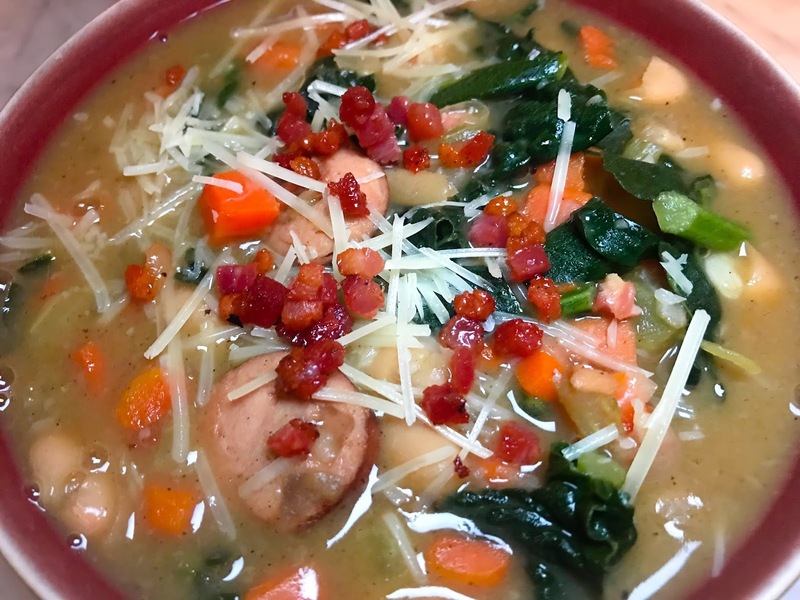 A hearty white bean stew seemed like the perfect thing. I made this version using canned beans allowing this dish to come together in just under an hour. I also took advantage of Trader Joe’s pre-chopped mirepoix to minimize prep time to next to nothing. Greg had recently made stock from a mixture of pork and lamb bones. The wine’s lightly funky note made me think it would work with the light gaminess of the stock. (Of course, you should use whatever stock you have on hand.) I also spiced it in a way to reflect the flavors in the wine: white pepper, a scant pinch of allspice, rosemary, and bay leaves all picked up notes in the wine. The white pepper particularly brought out the same note in the wine. It made a lovely pairing. 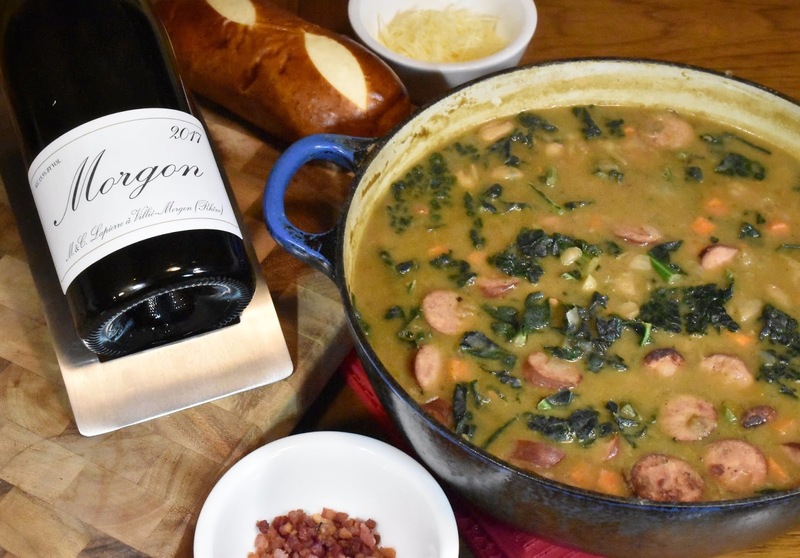 The wine became even brighter alongside the stew–it was really refreshing and lightened up the rich stew. The earthy notes in the wine matched the earthy notes from the beans and the smoky meats. This meal was all kinds of cozy. 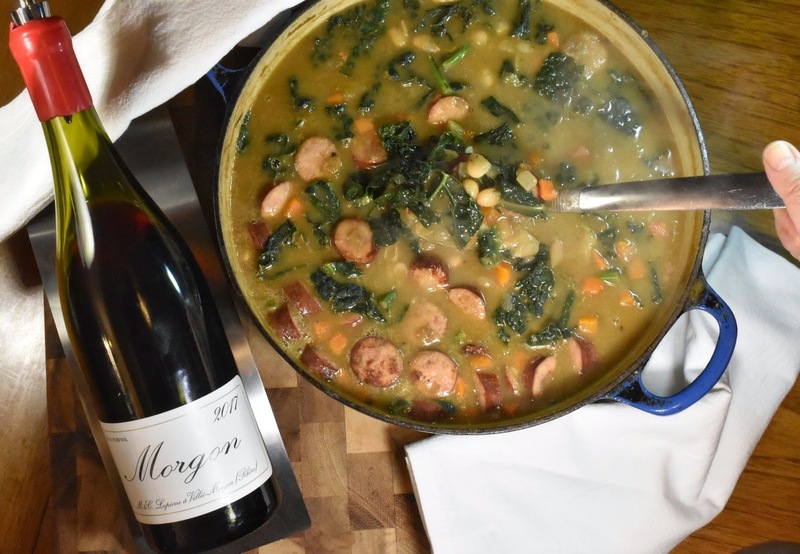 Beaujolais’ pairing versatility is one of the things that make it a somm favorite. When I tasted it with my coworkers we shot out pairing options that ranged from meaty dishes to seafood stew. Split pea soup also came up and, again, ham, ham, ham. Food & Wine recommends a Spicy Tuna Burger with Soy Glaze with the Lapierre Morgon. You can find additional pairing suggestions of Beaujolais in general here. 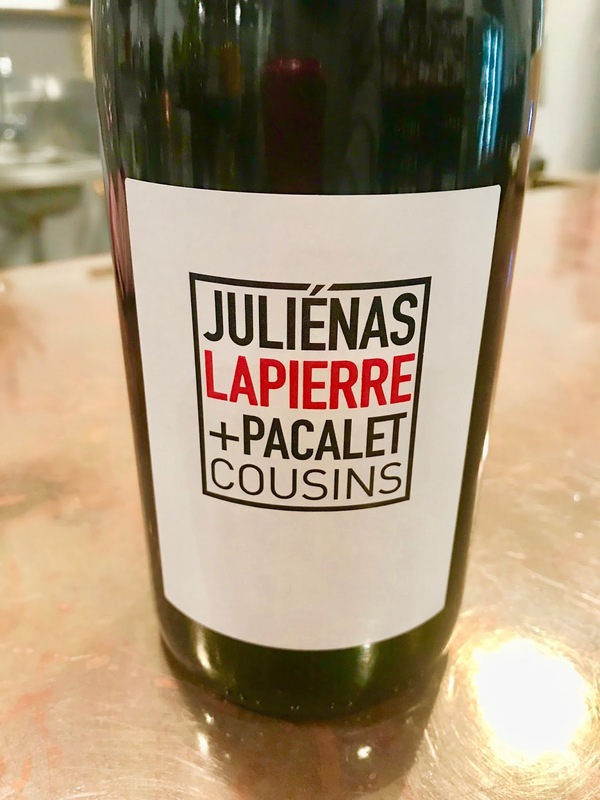 At the store we tried this wine side by side with the Pacalet & Lapierre Julienas Cuvee Cousins 2017, a collaboration between Mathieu Lapierre with his cousin, Christophe Pacalet. This wine had more body, more fruit, and black pepper. If you prefer a more fruit-forward Beaujolais, this would be a great option. I’m sure it would have also been delicious with the food. Taken from the Lapierre and Kermit Lynch sites. I got this bottle for $35 at Bay Grape, which is also the price it’s available for on Wine.com. I’ve found this wine to be pretty reliably delicious from vintage to vintage, so while be a little pricier than the average weeknight wine, it is a worthy Attainable Indulgence. On the other hand, this wine tends to be fairly reasonable on restaurant wine lists, and it’s kind of an ideal choice when you consider that it can probably pair decently well with whatever everyone at the table has ordered. Lightly grease a large pot or Dutch oven with a little cooking oil. Add the pancetta or bacon to the pan and cook over medium-high heat until lightly crisped and golden brown, approximately 4 to 5 minutes. Once crisped, transfer the pancetta to another plate. Leave any fat that may have rendered out of the pancetta. Add the sausages and cook until lightly browned, stirring occasionally–about 3 minutes. Transfer the sausages to another plate. Deglaze the pan with the white wine vinegar and reduce the heat to medium. Add the mirepoix (carrots, celery, and onions) to the pan. Season with salt and cook until the vegetables have begun to soften–about 10 minutes. Add the garlic to the pan and sprinkle the vegetables with the 2 tablespoons of flour. Toss and allow the flour to cook on the vegetables for another minute or two. Add the sausage and ½ the bacon (reserve the rest) back to the pan, followed by the beans, mustard, white pepper, allspice, bay leaves, the spring of rosemary and the stock, and stir to combine. Bring to a boil, then reduce to a simmer and cook to allow the the flavors to come together and for the stew to thicken until the liquid lightly coats the back of a spoon–at least 15 to 20 minutes. Add the kale during the last 5 minutes of cooking, just so that the leaves wilt and become tender. Serve in bowls with the remaining bits of pancetta and Parmesan (if using) sprinkled on top. Photo credit on this series to Greg Hudson. Please join us this month as the French #Winophiles learn what biodynamic wine has to offer. Our posts go live this Friday and Saturday and we'll be chatting about what we learn this Saturday Jan 19 from 8-9am Pacific time. Here's a preview about what we will be discussing. 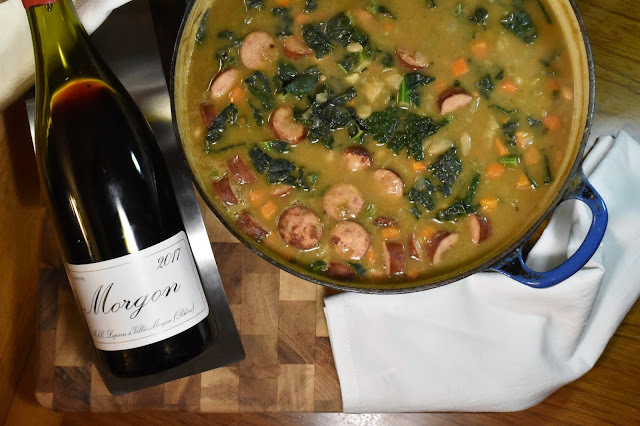 Nicole from Somms Table shares "Cooking to the Wine: Marcel Lapierre Morgon with a Hearty White Bean Stew"
Pinny from Chinese Food and Wine Pairings shares "Detox with Organic French Wine and Cantonese Light Flare"
Join us the Third Saturday of the month for our twitter chats and check out our blog posts! On February 16, 2019, Wendy Klik of A Day In The Life On The Farm hosts our exploration of Provence and encourages us to seek wines beyond the pink -- even if it's just after Valentine's Day. The Guardian: Has wine gone bad? Thank you so much Susannah! That is such a wonderful compliment. Thanks Wendy, let me know how it turns out if you do make it! I so enjoyed this post and really look forward to your future post on Organic/Natural/Biodynamic wines and practices!